Higgs boson particle discovery announcement from CERN on July Fourth may pain American physicists. 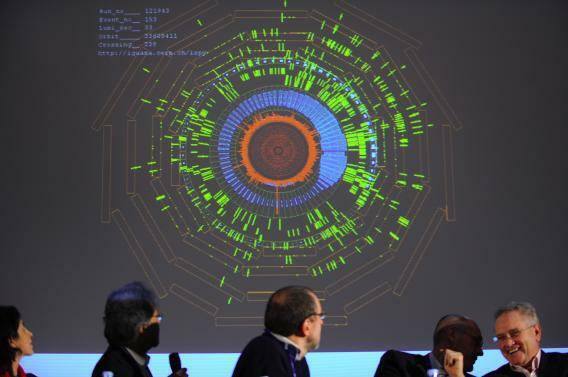 CERN scientists during the restart of the Large Hadron Colliderin November 2009. Tomorrow, even Americans who don’t wear red, white, and blue on a day-to-day basis will celebrate their country with fireworks, hot dogs, and perhaps the occasional ruptured stomach. Scientists who think they have come tantalizingly close to discovering a long-sought subatomic particle have decided to press ahead for another month rather than immediately leave the field—and a probable Nobel prize—to their main American rival. [T]he US Fermilab says the odds of its Tevatron accelerator detecting the famed particle first are now 50-50 at worst, and up to 96% at best. And indeed, in 2010, there were reports that the United States was about to announce the discovery of the Higgs. Now, though, it appears that the Europeans will win—even if, as Wired points out, work at Fermilab and elsewhere in the United States has contributed in a big way to tomorrow’s presumed announcement. Was CERN deliberately trying to taunt the American team by scheduling the announcement for the Fourth of July? Probably not—the date was selected to immediately precede the International Conference on High Energy Physics, which begins July 4 in Melbourne. But the coincidence must surely be a twist of the knife in the egos of America’s physicists.